The Wanamaker Mile is the signature event of the Millrose Games, but the six-hour track party at New York City’s Armory on Valentine’s Day was loaded with enticing appetizers. Among them was the 25-lap, 5000 meter race. 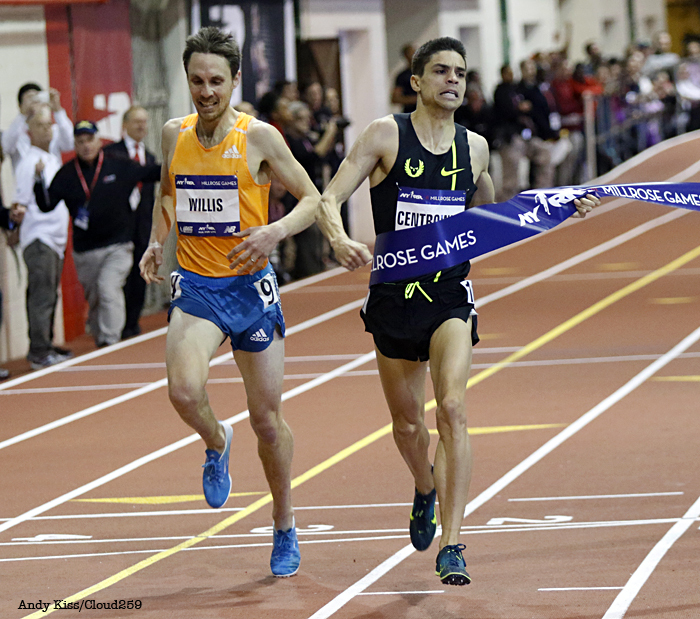 Cam Levins was the favorite after his stellar performance at the Armory two weeks prior. The pacer for this race was to run 8:00 for the first 3k (13:20 pace), and from there Levins was expected to speed up over the last 2k to beat his own Canadian indoor record of 13:19 while securing the outdoor championships international qualifying standard of 13:23. Though the 5000 is a race in which all the action seems to come late, the positioning set up the drama early in this one, as Lopez Lomong of the Bowerman Track Club quickly settled in behind Levins. 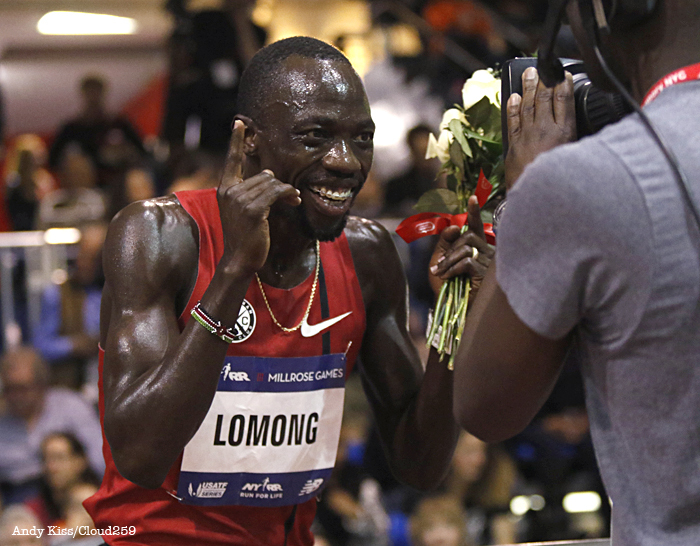 Lomong possess great speed – he set the Wanamaker Mile record with a 3:51.21 in 2013 – and at some point he’d try to use it. After the pacer dropped out, Ryan Hill of the BTC led the train, and close behind Levins and Lomong were BTC teammates Andrew Bumbalough and Matt Tegenkamp. Around and around they went, Levins in his Nike Oregon Project black surrounded by the blood-red of BTC. Levins is nobody’s idea of a villain, but this was taking the appearance of a choreographed strike. Levins did not increase the pace at 3k as expected, and the race, if tactical already, had become moreso. Lomong passed Levins with four laps to go, Sam Chelanga burst to the front with three to go, then Lomong reeled him in and outpaced Hill to win by two tenths of a second in 13:27. Levins faded to sixth in 13:33. Some days you have it, some days you don’t. Is there a runner who relies more on adrenaline than Robby Andrews? With 150 meters to go in the men’s 1,000, Andrews leapt across Olympian Duane Solomon to an opening on the outside and gunned for the finish. His 26.34 split on the last lap was the fastest in the race. Erik Sowinski was the only one able to respond and held on for a narrow win in 2:21.18. As in the 5000, it wasn’t the finishing time the athletes were looking for, but was thrilling nonetheless. Races with ambitious targets often end in carnage. 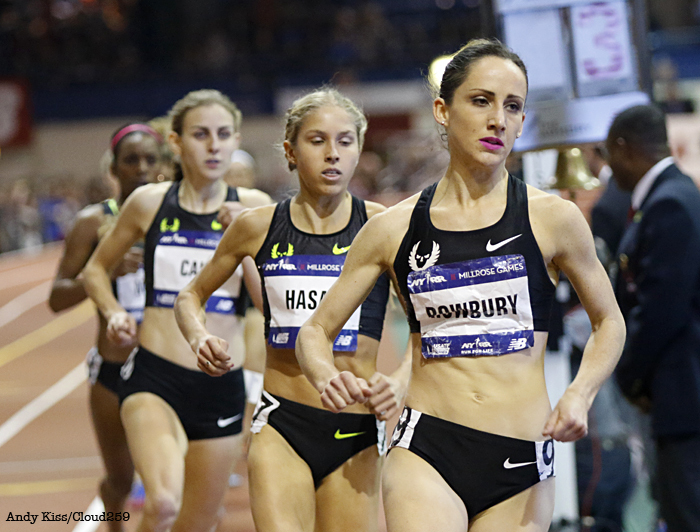 In the women’s Wanamaker Mile, Shannon Rowbury took aim at Mary Decker’s American indoor record of 4:20.5, and her Nike Oregon Project teammates Jordan Hasay, 18-year-old Mary Cain (last year’s champion in 4:27), and Treniere Moser went with her. Trailing the NOP quartet with a pitchfork on her singlet was Arizona State runner Shelby Houlihan, who, while coming in with an indoor PR of 4:38, had said she could run a 4:25. Of the chasers Hasay held on the longest, but Rowbury pulled away, shifting the attention solely on the clock. With a lap to go, Rowbury needed to split 29 seconds to get the record. Thirty meters from the tape she locked up, Julia Lucas–like, to the gasps of the crowd. Rowbury staggered across the line, and though it clearly wasn’t a comfortable win, it was nonetheless a win by a comfortable margin. No faulting the effort, there. Rowbury’s time was 4:24, Moser was 2nd in 4:27, Hasay fourth in 4:28, and Cain eighth in 4:31. Houlihan finished 7th in 4:30, achieving a sizable new PR, if not her goal. 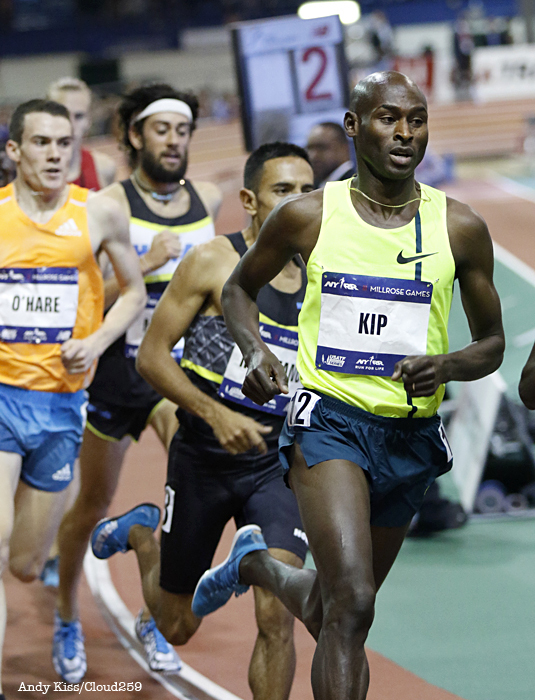 The main event featured a collision of world class runners. 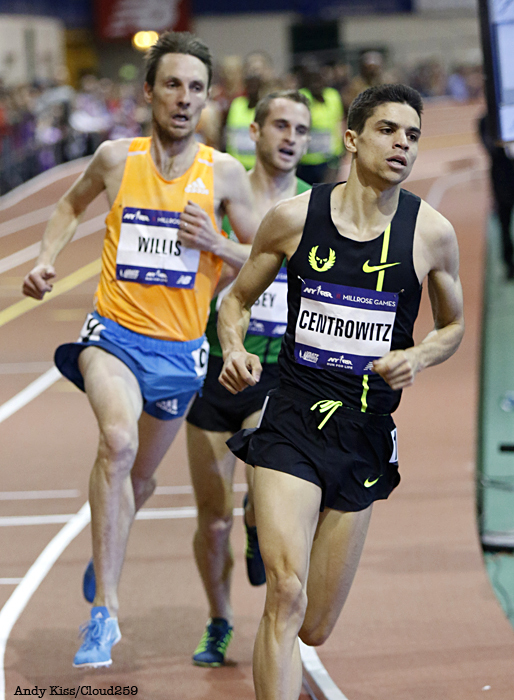 Matt Centrowitz of the Nike Oregon Project and New Zealand’s Nick Willis, the 2008 Olympic silver medalist in the 1500, were expected to challenge the meet record of 3:51.21. Defending champ Will Leer, who ran 3:52 last year, was running, as was 2012 Olympic silver medalist Leo Manzano. And then there was the old man of the track, 40-year-old Bernard Lagat. Knocking off the masters record of 3:58 seemed a given for Lagat. Since the Millrose Games moved to the Armory in 2011, Bernard Lagat has run the 5000, 2-mile, and 2K, each time setting an American indoor record. At this stage of his career the mile is not his forte, but could the 8-time Wanamaker Mile champ really be counted out for the win? Known both for his longevity and impeccable form, Lagat glides on the track like Gretzky on a breakaway. With his patented kick, he finished first among the chase pack, running 3:54 for fourth overall, faster than all but two of his winning Wanamaker Miles from 2001 to 2010 at Madison Square Garden. At the bell, the last lap of so many run by kids, high school students, college students, pros, and masters over the previous six hours, it came down to what everybody had been waiting for: the brash, wisecracking 25-year-old Centrowitz in the lead, and the hard charging new dad, Nick Willis, 31, close behind. Willis pulled even on the backstretch. Willis had the momentum, but Centrowitz had the inside lane. By hanging back earlier in the race Willis used his competitors as stepping stones to the front, but he also had to run a few extra yards to get around them. Centrowitz drifted into lane 2 and Willis into lane 3. It was Centro’s quickness versus Willis’ speed. The front runner won by a tenth of a second in 3:51:35, barely off Lomong’s meet record from 2013. 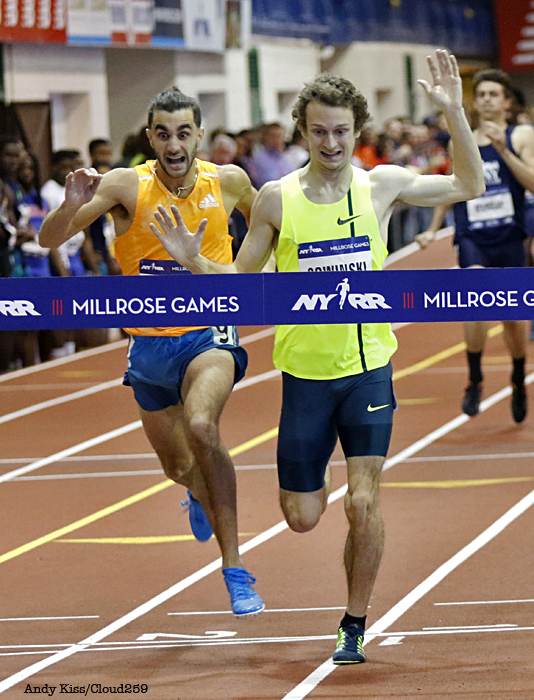 See our full photo gallery of the Millrose games.